If you are a blogger, or an aspiring one, this is the post for you. 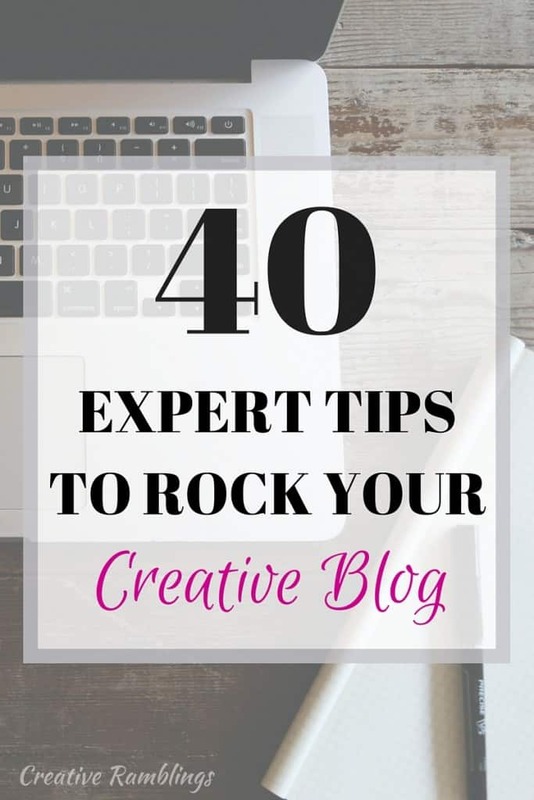 I have collected 40 expert tips to help you rock your creative blog. These tips are from rock star bloggers that I admire and have turned to for advice and guidance over the years as I have worked to grow my blog and business. These are solid tips you can start implementing right now to rock this blogging world! Excited to read them? I bet you have friends who would love these tips too. I started as a small hobby blogger and decided in early 2015 that it was time to make some money and grow this blog and brand into something more. I have used so many of these tips to grow while keeping my authenticity and passion for what I do. If you want to dive a little deeper I detailed the 6 resources that helped me up my blogging game in this post. These accesible resouces really helped me take my hobby to the next level and grow as a blogger. Now, let’s dive in! Be sure to bookmark this page or pin it because you are going to want to keep these tips close by. In no particular order, because really how can I order this awesomeness? 16. Write for yourself first. If you find the article interesting, helpful, and useful likely your audience will too. Many of my most viral posts are real life problems I have solved for our home. For example, we lived in a one bedroom apartment in Florida and had a tiny kitchen with only drawer. We needed more storage, and I turned a door into vertical storage for all of the things that couldn’t fit into the one drawer. That posts has rocked it since 2012. Jamie, C.R.A.F.T. Wow, seriously wow. This is a gold mine of information, and more than 40! You have no idea how many notes I have taken along with deep breaths as I read and compiled this information. These ladies have their blogging act together and I hope you have taken something away from this. Be sure to share this with your fellow bloggers to life them up and encourage them a bit. Tell me, what tip will you be implementing today. And what is your best tip for rocking the blogging world? Great tips! I was nodding my head at every single one! So very honored to be included in this mix of blogging rockstars. So many wisdom bombs dropped in this post. Off to share! Thanks again, Sarah. You’ve done the blogging world good by compiling this epic post. You are so sweet Lauren, thank you. I agree the wisdom here is priceless, I’m glad to share. Sarah, what a great resource for bloggers! Pinning! It’s a great post – and I’m thankful to be included. Pinning! From a newbie blogger, thank you for all these tips! It’s hard not to compare and want the success you see on others sites but I have to keep remembering that they were once where I am now. Baby steps! Visiting from Blogtalk. Yes, baby steps is key! Thank you so much for stopping over and I’m so glad you found this encouraging! What a wonderful resource ofn encouragement and information. Thank you for putting this together! I’ve read through this post at least 3 times, and every time, I take away a different piece of fantastic-ness. All these bloggers have such sound, sage advice. I’m thrilled to have been included, Sarah. Thanks for piecing together such an awesome project. Heather that is so wonderful to hear, and I have to agree. Thank you for contributing, I too am getting so much amazing advice out of this post. That’s so good to hear Eva, thanks for reading!